Rural countryside meets urban city styling with this Lancaster Table & Seating antique walnut solid wood live edge bar height table with 4 bar chairs. 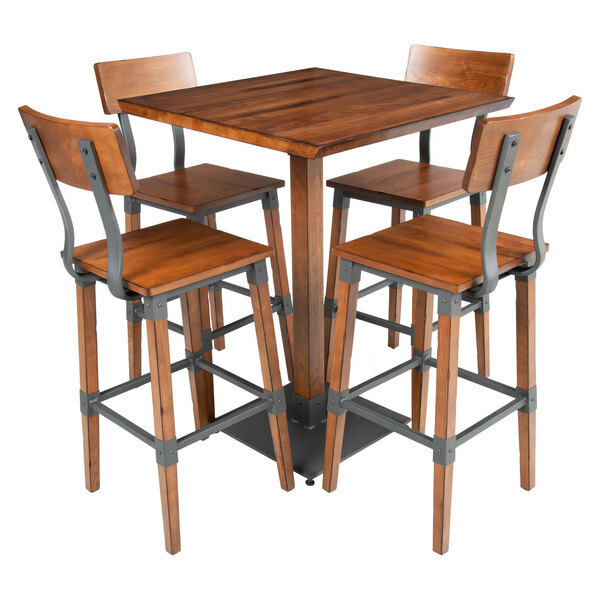 Coming with an attractive table top, compatible bar height base, and 4 matching bar chairs, this set provides you with everything you need to set up and complete the look of your dining area. It's sure to add a rustic element with contemporary flair to your restaurant, bistro, or bar! Combining a modern, square seat with a curved, rectangular back that cradles the spine for comfort, each bar chair provides patrons with a way to relax after a long day. The seats, backs, and legs are made of solid wood with an antique walnut stain, creating a captivating display and making each chair easy to wipe down in between guests. The dark gray metal frames ensure a stable foundation, and the feet are capped with plastic glides, helping to protect floors and keep unwanted noise to a minimum. Each chair has a 300 lb. weight capacity to suit most patrons. Plus, the entire set comes unassembled to save you on shipping costs. This Lancaster Table & Seating dining table and chair set meshes the warm, natural look of wood with rugged, metal components for a vintage yet trendy, industrialized appearance that your guests are sure to love!